The gas pump you use to fill up your car might look innocuous. But trouble could be lurking inside. Crooks are targeting gas pumps across country in skimming attacks to steal customers' credit card and bank account information. If you think high gas prices are ripoff, just wait until you get your credit card bill or see your bank statement after falling victim to a tampered gas pump. Here's how it works: Crooks attach an inexpensive device called a skimmer inside or onto a gas pump. The device captures credit and debit card information every time customers swipe their cards. Sometimes a secondary PIN pad is installed to capture PIN numbers, or a tiny camera is attached to record video of customers punching in their PINs. Investigators say it takes crooks less than a minute to install the equipment. They return after a period of time to retrieve the equipment, or in some cases they use wireless devices that transmit the data directly to them. Then they use the information to make counterfeit cards and run up purchases or empty bank accounts. The crime has been reported from San Francisco to New York and in big and small cities in between. Usually organized crime networks or gangs are behind skimming operations. So how do you keep your credit card and debit card accounts safe at the gas pumps? • Check your credit card balances frequently online to make sure no fraudulent purchases have been made. If you find something awry on any of your accounts, call your credit card companies immediately. • Go inside to pay for gas purchases. Sure, it's less convenient then paying at the pump, but your credit card transaction is safer. • Use credit cards instead of debit cards if you pay at the pump. If crooks get hold of your debit card, they could empty your bank account. 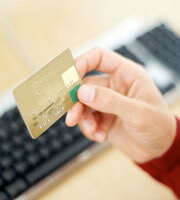 With your credit card information, they can run up fraudulent purchases, but they can't steal your hard-earned savings. Although debit cards with VISA and MasterCard logos have zero liability policies, you could still be out of cash while you work out the situation with your bank. Consider gas credit cards which offer rebates on gas purchases and other items. 0 Responses to "Protecting Your Credit Card at the Gas Pump"